Mark Adams (1925 – 2006) designed such things as large-scale tapestries and the magnificent stained glass windows of Temple Beth El in San Francisco, but his smaller works have a wonderful, intimate appeal arising from his decisiveness in choosing which of the visual elements before him to pursue, and his clarity in executing them. 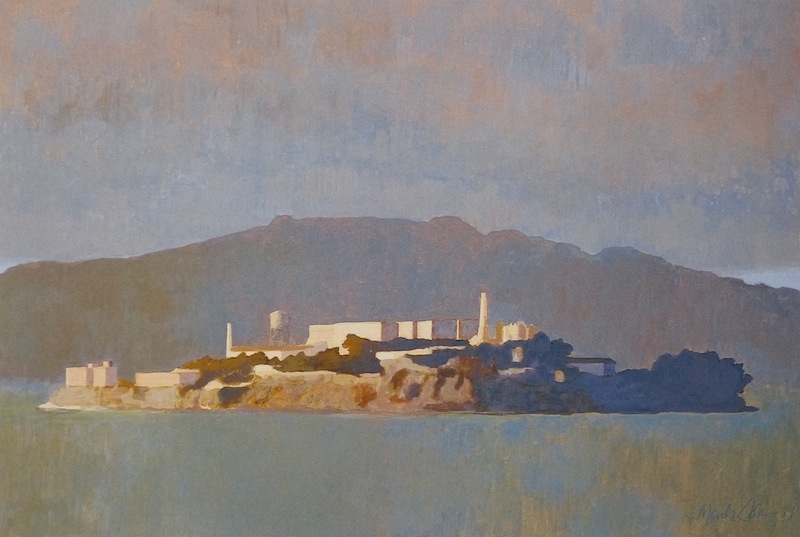 “Alcatraz” is divided into three bands–sky, mountains, and water–with the island settled in the middle. The bands are simple in shape, but with a variety of texture and color that keeps them interesting and even a little surprising. The island is handled similarly, but with a full range of tones, and more variety of color, starting with warm off-whites on the left to that bold, flat blue on the right. The whole is so clear and undisguised in its design that it seems simple, but the more you look the more complexity you find. We get the same decisiveness in “Lily in Shadow”, although here the smaller size and single dominant object allows a very austere handling–just the texture of the paper–without monotony. 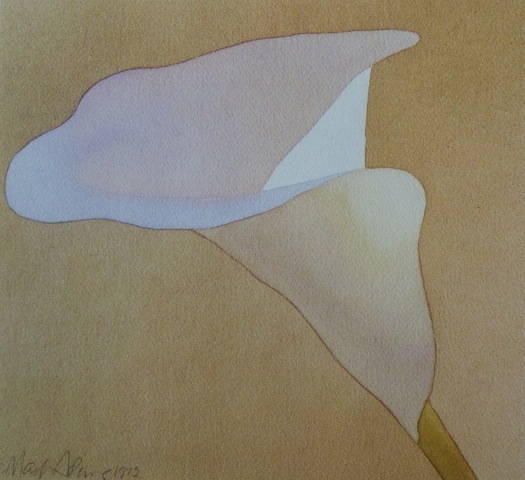 But the lily and the background are full of shapes, and the shapes, while simple-seeming, aren’t simple. Follow the outlines and the fall of light over the lily. 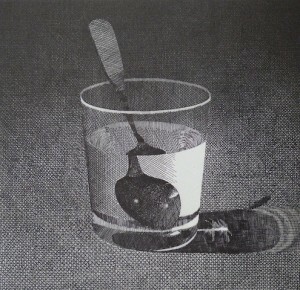 Then we have “Glass With Spoon,” as refined and restrained an etching as “Lily” is a watercolor. The tones are created by the precision of the lines rather than selective wiping of the plate surface. The technique is so transparent that your eye sees undisguised lines and convincingly described shapes at the same time. Image and work of art float together. Which is true of all three of these pieces, and of Adams’ work in general, and is a big part of what makes them so satisfying. They are clear, not simple. It takes time to see and discover them, and you can look at them again and again without wearing them out.